One of UMIDIGI's earliest 2019 releases (and also the first one under the brand's F-series), the UMIDIGI F1 targets power-hungry middle-class smartphone shoppers with its assortment of pros and cons. 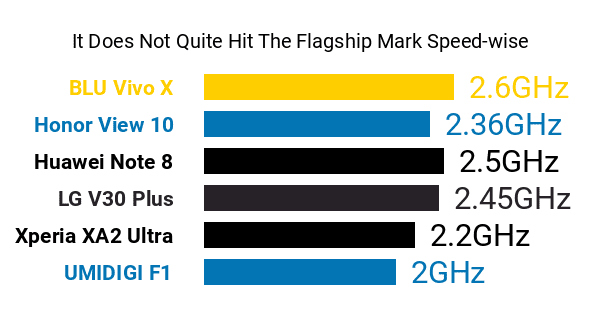 Sadly, it won't find itself alongside the best octa-core phones of its time, at least considering its Helio P60 engine's 2GHz top speed -- some full-blown high-enders use processors clocked at roughly 2.5GHz. Having two distinct 2GHz quad-core clusters sounds noteworthy, though. Another slight flaw is its relatively modest 4GB RAM , given the number of competing phablets that boast 6GB or even 8GB RAMs. 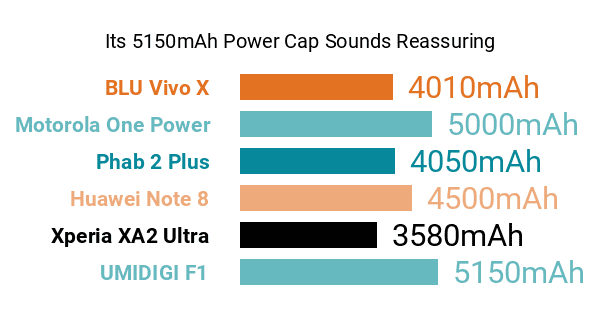 On the flip side, its favorable specs are headlined by a large 5150mAh battery that powers up through an 18W charging system, calling up this Phonerated list of the best big-battery smartphones available. Also, while its 6.3-inch screen sticks to a 1080p FHD+ resolution only , instead of shooting for a premium-class QHD/QHD+ (1440p) sharpness, its 19.5:9 aspect ratio and waterdrop notch design nonetheless make it a pro in our book. Imaging-wise, the F1 possibly holds its own versus many other middle-class contenders as of this on-paper review, touting a 16- plus 8-megapixel dual rear camera rigged with a 6-element lens and a dual-LED flash. Sitting on its small screen notch is a respectable 16-megapixel f/2.0-aperture selfie camera whose resolution was within the high-end category when this model was released. The F1's pros and cons also include a 128GB storage memory expandable by up to 256GB , NFC (Near Field Communication) support for cashless mobile payments, and two nano SIM card trays. It runs on Android 9.0 Pie out of the box and is offered in Black, Gold, and Red. Summing up, although it has some slight cons on the hardware front, the UMIDIGI F1 nevertheless caters to those eying a high-stamina, middle-class phablet.